Before I start I want to say that I am sorry for not posting for over a year but I should (hopefully) post at least 1 time a month. 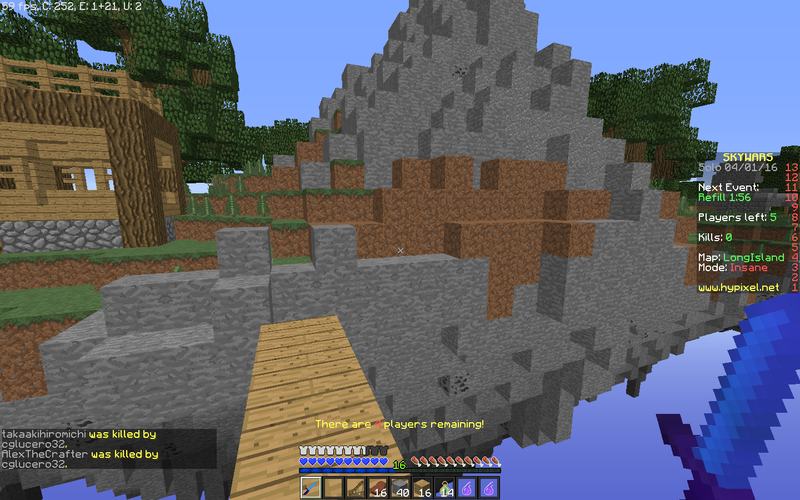 If you play Minecraft you might play on servers, because I know I do. 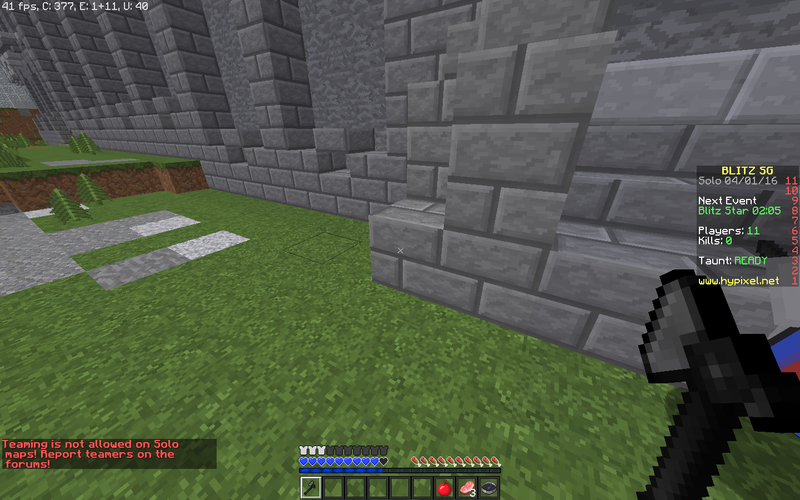 My favorite server is Hypixel. 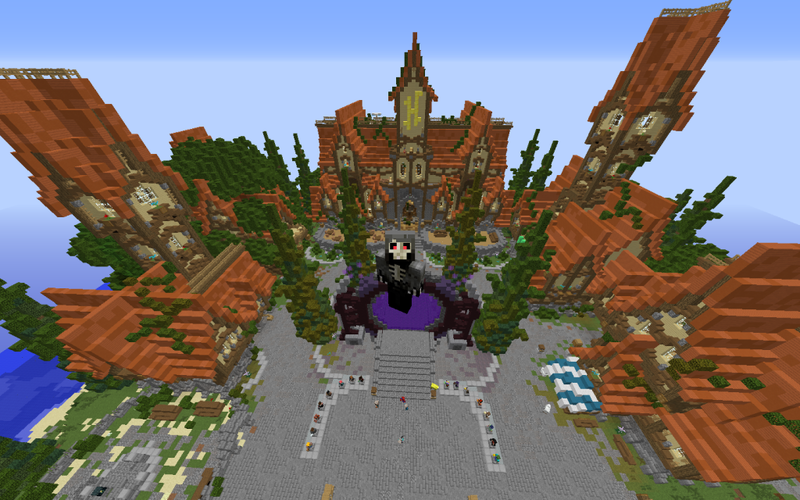 Hypixel is a server for anyone that loves minecraft because it has player vs player games, building games, and much more. This is a guide on how to add, play on, and most importantly have fun on. If you want to join Hypixel but don’t know how, follow these steps. 1. Open up Minecraft and go to multiplayer. 2. Click add server 3. Type the name of the server 4. 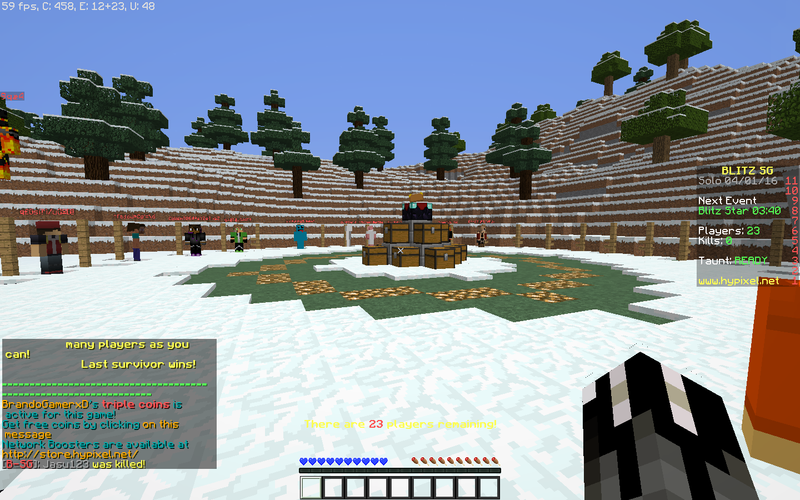 Then type in the server ip it is mc.hypixel.net. Then click done, the server should have appeared in your server list. Once you have added the server either double click the server icon or click it once and then click the button on the bottom left that says “join server” and click it. It might take a minute but you should eventually join the server. It should put you in the main lobby. You could explore or you could just go into a game. If you want to join a game click the compass in your hot bar. It will put up a bunch of different games, with each game having a different icon, like Blitz Survival Games is a diamond sword, Skywars is a eye of ender, The Arcade Games is a slimeball, Mega walls is soul sand and Smash Heroes is a spiderman head, ect ect. Click on the icon of the game you want to play and it will transport you to that lobby run towards (or fly if you have a rank) the signs. There will usually be different modes represented by each sign, examples skywars has solo normal, solo insane, mega, team normal and team insane. Click on the sign of the mode you want to play and you will be transported to that game. It might take a moment for the game to start because you need to wait on enough players to join. Then the game will start it might take you a few games to understand how to play the game but hey, I’m not gonna spoil it for you. To begin and survive in Minecraft you need one important thing, wood. When you first spawn in Minecraft go to a tree, punch the tree and pick up the wood. Then go to craft and make 4 wooden planks. Next use the wooden planks to make a crafting table. Once you have crafted your crafting table, place your crafting table on the ground. Then get 4 more wooden blocks and tap on your crafting table. Craft a stick and a wooden pickax. You can use the pickax to go mining explore and pick up cobblestone blocks. Use the crafting table again to make a stone pickax and go back to the tunnel you made when mining. Then expand your mine and try to find 3 iron ores. They look like stone blocks with tan color dots in then. Then craft a furnace and smelt the iron ores until they turn into iron ingots. 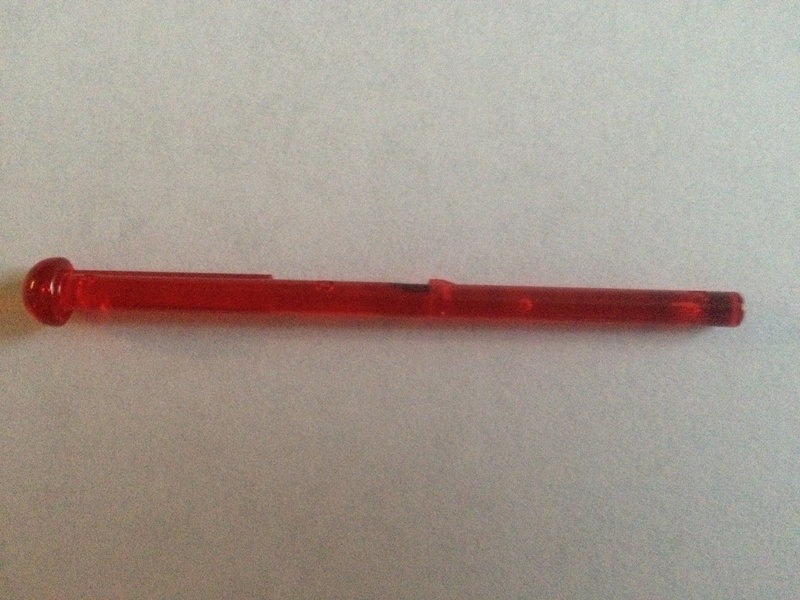 Use these to make an iron pickax which is the second best pickax in Minecraft. In case you have never found a gold ore they are terrible for making tools and are really flimsy and never last long. Wooden tools are better than gold but the best and greatest of them all is the diamond. these make the best and longest lasting tools and armor. You need a stone pickax to pick up iron ores, a iron pickax to pick up gold and diamond. I found some of the summer 2014 sets for the Lego Chima series coming in August, and the plot for the Lego TV show as well. After the final battle with the scorpions, spiders and bats Chima divided in half and an orb of Chi fell into the middle of Chima awakening some of the legendary tribes. The Vultures, saber-tooth tigers and the leader of the new bad guys the wooly mammoth tribe. These new tribes tried to take over the world of Chima but some more new tribes were awakened the leopards and phoenixs these tribes helped the good guys so now it is fire v.s. ice who will win. Now lets go on to some of the new sets. Vardy is speeding away with the leopards Chi. Lunder the leopard is working in his mini weapon forge when Vardy flies by give chase with Lunder suddenly Vardy fires flick missiles and Lunder barely dodges. After a while Lunder wins and brings victory for his tribe. This set comes with 2 mini figs and has 217 peices and is 20 dollars. Lagravis king of the lion tribe has been captured by the fierce saber-tooth tiger Strainer. Save him with Eris in her fire eagle flyer. Change to fire Chi mode and soar high over Chima, when Strainer is in your sights aim the missiles and fire! Send that Chi stealing thief back to where he came from. Free the lion king from his icy cage, and fly away after saving the day. The flaming jet has 330 is normally $.30 and comes with 3 mini-figs Eris, Lagravis and strainer. The last set I’m going to do a review on is called Sir Fangers Saber-tooth walker. This set is the biggest I am reviewing at $.40 and has 415 pieces and 3 mini-figs Gorzan, Sir Fanger and Stealhor. Gorzan has been captured help him break free with his giant blayzhamma. 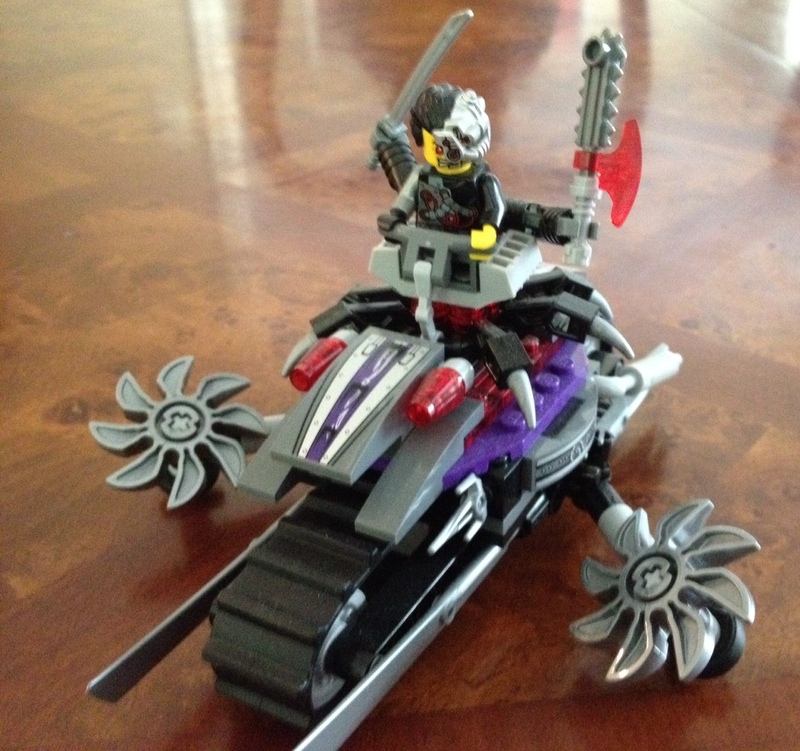 Sir Fanger attacks in his Saber-tooth walker and fires his icy missiles and Gorzan rolls out of the way Sir Fanger sends a mini detachable motor bike who will win this fight only YOU can decide who will this fight. who will win fire or ice? I only did a review for every set only half of the sets. So I will do part 2 soon so get ready for that. These sets will be coming in August. They will also be making 7 Chi-ups and a few speedorz. I will try to do a review on those later. So we will all be looking forward for that. I jus t get a epic Lego set from the Lego Movie them. The set is based on the desert world from the Lego Movie. Bad Cop is after the master builders and Emmet is trapped on an abandoned railroad track With super secret police alligators underneath him. Then Bad Cop fires lasers and the railroad collapses. The set includes bad cop super secret police car the has flip lasers. 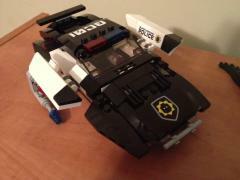 And has some nice police car lights and the side and on the head of the car. 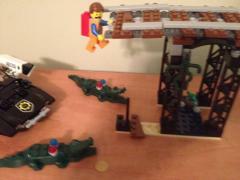 This model includes 2 mini figs Emmet and Bad cop and 2 police alligators. 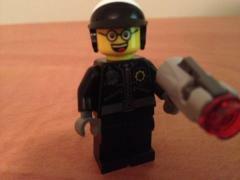 Bad Cop has a double sided head that changes him to good cop. The set comes with a new blaster that can really shoot. The railroad has a collapsing function. The Set is 30 dollars and has 314 pieces witch in my opinion is a good deal. It can be found in toy stores such as Target, Toysrus and Walmart. Some Nerf guns are better than others some are good for stealth missions like Strongarm and Retaliator where Rampage, Roughcut and Stampede are good for an all on war. So I am here to do a review on some of my favorites and will let you decide which is better. Lets start with Rampage this is my absolute favorite Nerf gun they made in 2013. This gun can hold 25 darts and can shoot them super fast in a slam fire and can shoot all the darts in about 15 seconds. Or you can save them and shoot them one at a time because it takes mine about 2 and a-half minutes to reload. It is a fairly loud gun with quiet cocking and loud shooting. My Rampage’s shooting range is normally 55 to 60 feet. Its colors are mostly blue with a orange chamber on its side. The gun is about 2 feet long 6 inches high. Now lets talk about Retaliator. This gun can be taken apart and changed between 4 modes rifle, pistol and 2 more. Shoots about 50 to 55 feet a pretty good distance. Comes with 12 darts and is takes about 30 seconds to reload. Its also a great gun for almost any mission it does not make a lot of noise when shooting is an okay sniper has good accuracy for 30 feet before it starts to drop. Its about 10 inches long in pistol mode 2 and a-half feet long in rifle in shorter rifle mode is about 2 feet and in the last mode is also 2 feet. Colors are blue and orange and some white. So pick up your Nerf guns come up with a strategy and have a Nerf war or go on a secret mission or just practice. Just remember its Nerf for nothing. 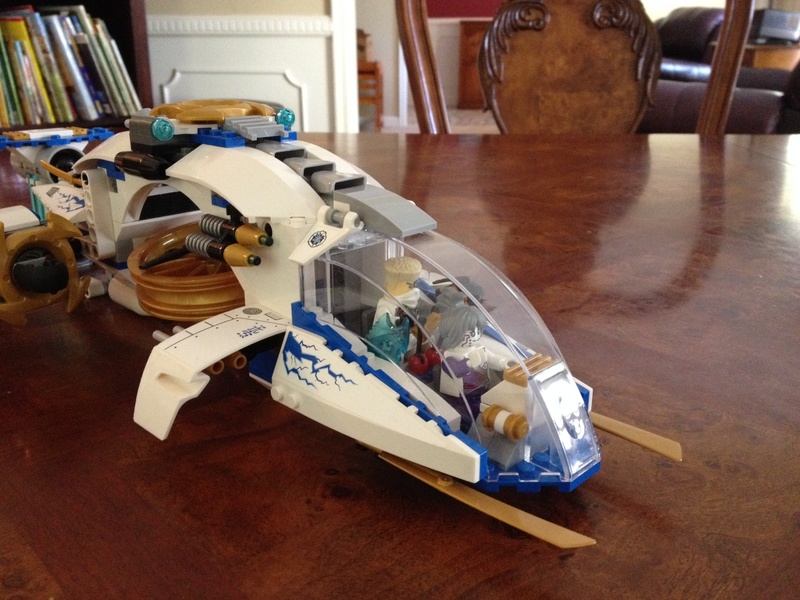 The Ninjacopter is a high tech fighter jet hacked by Zane using his techno-blade. A techno-blade is a weapon that can hack in to a machine to give the user complete control over it. This Lego set is one of my favorites. It can change from attack to defense mode, has rotating cannons and lots of flick missiles. It also has a lot of detail but is a pretty simple set and is a great model for kids and teenagers. I would recommend this set for ages 7 to 13. It also includes 2 nindroid jets that can fuse together to make a bigger model. This Lego set comes with 4 mini-figs Pixal a robot, Zane also a robot and 2 nindroids. Now lets do a review on another great set the Overborg attack. This set is a sorta small in most stores its about $20. Its like a off road robot tank with saws on each side to slice up rubble, rocks, dirt, trees you name it. One things for sure and that its built for destroying. The rider is Cygrus Borg an inventor that was mind controlled by the evil Over Lord and turned bad. 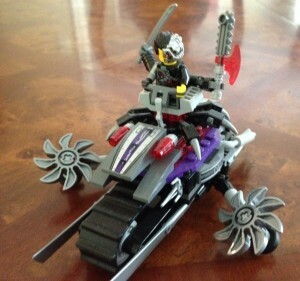 The set includes the green ninja and his speed bike and Cygrus Borg. I hope you enjoy staging your own fights with your Lego sets like I have. 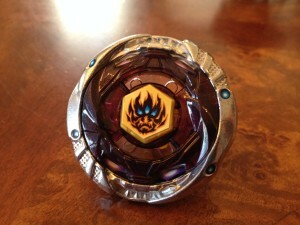 For those Beyblade fans out there, I challenge you to an online Bey contest. Lets see whose Beys can spin the longest. So time your Beys and comment on how long they can spin. For example if your Bey spins 2 and a half minutes (which most cant do). Post it and lets compare our Beyblade skills.This contest will be on the honor system. The competition will last April 28 2014 through June 28 2014. Minecraft is a game were you can destroy or build anything. When you first start playing Minecraft you are a guy called Steve, but you can change and customize your character. There are 2 different worlds in Minecraft, creative (my favorite) and survival. In creative mode you have limitless energy and in survival you can die and you have to make everything. If you have iphone, ipad, ipod or any other device you can download Minecraft for $6. The Lego Star Wars designers put spring loaded missile launchers in the new Star Wars sets. I got one in the Lego set the Vulture Droid. These new missiles shoot really good. The farthest mine has shot was 10 feet and the average is 7 to 8 to feet. I ordered Phantom Orion and he is awesome. He beat my most powerful custom Beyblade and spun 2 more minutes after winning. He looks really cool but has stickers that fall off.This is my favorite Beyblade that I have so far and the most powerful. You can turn his metal upside down to change his modes.